herding cats & burning soup: Guest Post w/ Donna Grant: Supernatural Smackdown! Guest Post w/ Donna Grant: Supernatural Smackdown! "Supernatural smackdown, huh? I doona know exactly what that is, but as a Highlander and a Warrior, I’m all about battle. With a primeval god inside drug up from the bowels of Hell, few would dare to take me on. But I’m willing to go against any who dare. I spent decades locked in the Pit of Cairn Toul Mountain after a drough found me and unbound the god passed down to me through my bloodline. That samedrough used her not inconsiderable magic to torture me time and again in the hopes that I would break and fall to her side. I suffered through it all. Then, when the time came, I helped others rise against her and we made our escape. I battled against her, never relenting, even when it meant that Druid magic sent me forward in time to present day Scotland so I could help kill her. It took far longer than any of us liked, but I wasna alone. There where the other Warriors – my brethren – and the Druids who had all come together to fight. We lost friends, fought in battles that will never be recorded in history books, and felt magic strong enough to knock you off your feet. Never did we relent. Until she finally lay dead. There was no rest, however, because there was another drough ready to take her place – this one more deadly that we anticipated. We were no’ prepared for his devious attacks. Each of us Warriors has our own special ability given to us by the gods we house. Mine – Memphaea – gives me the ability to control snow and ice. I use it to smother, to hamper vision, but there’s nothing like a spear made of ice as an effective weapon. Up close and personal or in a battle hundreds of yards apart, there is none who can withstand my assault. I see farther, hear more, jump higher, and move quicker than any human or animal. I can sense the magic of Druids and even determine if the Druid is mie or drough by the feel of their magic. I have claws sharp enough to decapitate with just one swipe, and fangs ready to rip out your throat. OOoo we have two giveaways today if yall are interested. It's completely okay to comment even if you don't enter for them! First up... a tote bag, water bottle & signed copy of MIDNIGHT'S WARRIOR. Ahhh jealous! 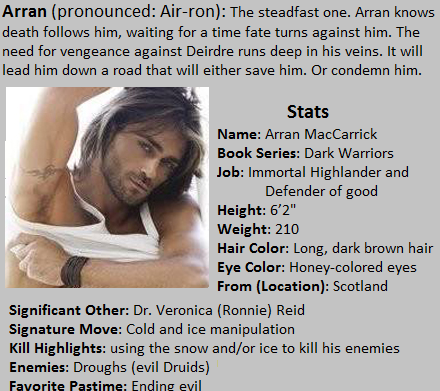 Just check out Arran's smackdown post and leave a meaningful comment. Open INT. So, what do yall think of Arran?! Yum?